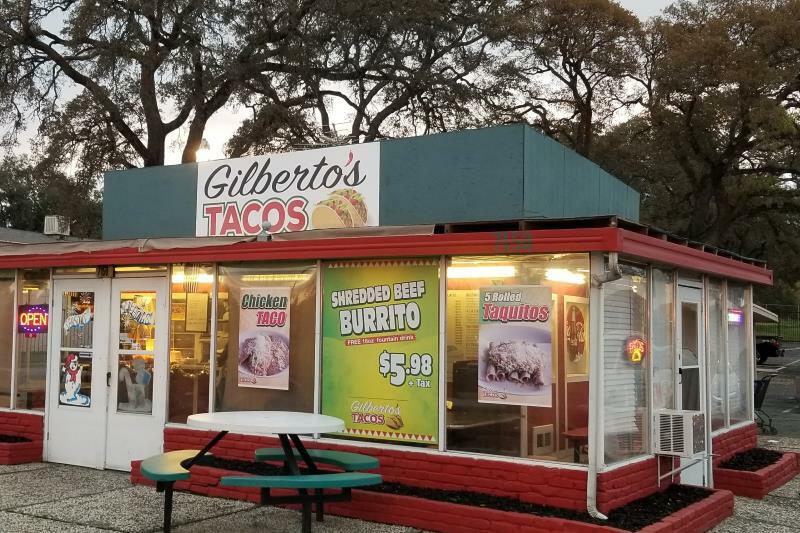 When my friend from Colorado came into town, she told me she didn’t like to eat at big box type restaurants, you know, like you can find in any city, so, I took her to Gilberto’s Tacos at 7150 Auburn Blvd. The area, across the street from where the old Sylvan Middle School used to be, still has the old town flavor about it and this establishment fits right in with that. Gilberto’s looks like it’s in a former Foster Freeze type building, in fact, it used to be Jolly Burgers a couple years ago, with a screened-in area to sit and eat, or an outside patio area with umbrellas for shade. It’s very casual dining with limited seating, and most people do take out. The gal behind the counter, Martha, or Patricia to her friends, and Ulises, her husband, are the owners, and along with their two kids they all help with this family run business. They’ve been here for the past two years now and are super-friendly people, with quick service. They serve a variety of items, from the daily specials and combo plates, to street tacos and churros. They also have a free chip and salsa bar, with the salsa packaged to go and free drink refills for customers. Breakfast burritos are among the most popular items they serve, and they’re served all day. The burritos are filled with eggs, potatoes, beans and cheeses and you can choose different meat fillings like sausage, ham, bacon, chorizo, and steak — all in big portions. For me, I love the super nachos. It doesn’t matter what type of meat you have put on them, chicken, carne asada, or even without meat, the portions are huge and they don’t skimp on garnishments. Fresh cilantro, cheeses, guacamole, sour cream, salsa. Delicious. My friend ordered the cheese enchilada and chicken taco combo plate, smothered in red sauce and cheeses, with rice and beans. Very filling meal, she loved it. My husband likes to order their fish tacos a la carte, which are always filled to the max with fresh garnishments. The fish is tasty, but not overpowering, and the tacos are a healthy size. My son always likes to leave with a fresh churro for dessert. You won’t be disappointed in the portions served here or the friendly service. It is clean and welcoming here in the Sylvan Corner Plaza, in what I like to call old town Citrus Heights. So, support our mom and pop shops. Eat local! Hours are Monday through Friday from 7 a.m. to 9 p.m., Saturday from 8 a.m. to 9 p.m., and Sunday from 8 a.m. to 5 p.m.
Doreen Brown is a longtime Citrus Heights resident and guest food columnist. The Sentinel welcomes guest columns and articles from community members about local topics. To submit an article or column, click here.